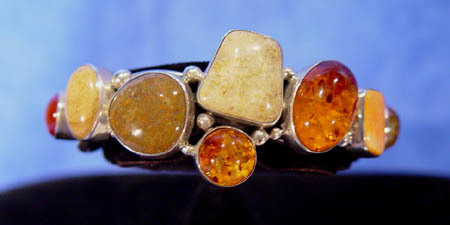 Amber is used by the Navajo and Pueblo Indians in their jewelry and fetish carvings (Zuni Indians). It is used either in cabochon form (see bracelet, middle photo), in beaded form, or as a stand-alone material used in Zuni fetish carving, depicting animals or human / corn maiden figures. Amber is not too frequently used in Native American jewelry and fetish carvings. Consequently, coming across a work in amber is a special occasion. It is rare for a work in amber to be on the market for long.